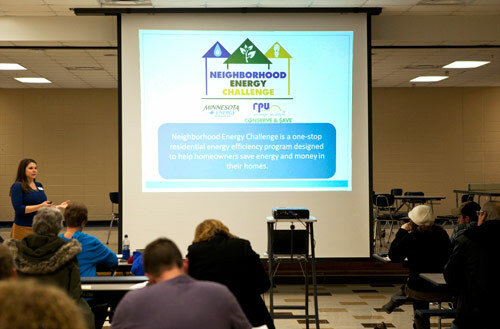 RPU and Minnesota Energy Resources have teamed up with the Center for Energy and Environment to offer Rochester homeowners the Neighborhood Energy Challenge (NEC), a full-service residential energy audit program. Learn about solar electric and heating systems from the experts. Many installation photos will show you how they look and how they are installed. Many questions addressed such as: How well does solar energy work in Minnesota? How much energy do systems produce? What are the costs involved and economics? What incentives are available? Is there maintenance? There will be plenty of time for questions and discussion. Bio: Micah is the operations manager for Solar Connection of Rochester, MN. In business since 2010, Solar Connection installs solar energy systems for commercial, residential, and farm applications. Solar Connection is a licensed general contractor and NABCEP™ Certified for PV Installation. NABCEP is the National Board of Certified Energy Practitioners. REGISTRATION: Registration for a Community Education Class can be made by calling 507.328.4000 or online through the Rochester Community Education website at https://rochester.ce.eleyo.com/course/11705/2019-adult-winter-spring—2/solar-energy-for-your-home-or-business. Brock, from Rochester, was a 2017 MMUA scholarship recipient. To increase awareness of public power. 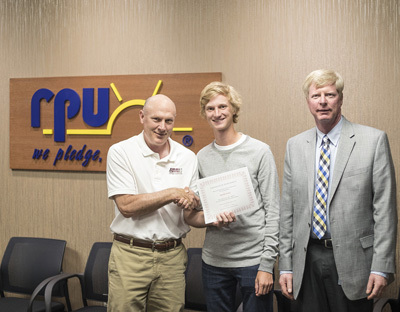 The scholarship fund is split into $2,000, $1,500, $1,000 and $500 scholarships, and awarded to essay contest winners who plan to attend a post-secondary educational institution. Entries are to interpret one or more aspects of the theme, “Municipal utilities: good for all of us.” This applies to municipal electric and natural gas utilities. Judges will look particularly for originality and the relevance of the theme to the writer and his/her city. High school seniors are eligible. Those eligible must be, or have as a legal guardian, a customer of an MMUA-member municipal electric or gas utility. Essays are to be original and from 500 to 750 words, typed and double-spaced. All essays should include a cover page, with the writer’s name and address. Entries shall be submitted to the governing body of the municipal utility. (The local governing body may appoint a separate individual or group to judge entries.) The local governing body will send the winning essay to MMUA for entry into the statewide contest. A committee of MMUA members will select the winners, with an announcement by mid-May. An independent person or body may be designated to select the winner of the local essay. If there is an independent body selecting the winner and they do not know who wrote which essay, relatives of utility personnel are eligible to enter the contest. Your local utility is the best resource for information and printed materials. Contact Tony Benson at RPU 507.280.1534 as a resource if needed. You may also want to visit www.mmua.org and www.publicpower.org. Scholarship money will be payable upon receipt of fee statement copy from an accredited post-secondary educational institution. The award check will be made payable to the contest winner and the post-secondary institution. If the contest winner does not attend an accredited post-secondary educational institution within two years, the money will revert to a trust fund and become available to future contest winners. Deadline to Rochester Public Utilities is Friday, March 29, 2019. For questions regarding the MMUA scholarship contact Tony Benson at 507.280.1534. RPU is proud to be part of the Rochester community, and we would like to share our expertise and knowledge with you. Tours are available by request. Certain facilities may not be available for tours due to safety, security, or maintenance reasons.